Climate change impacts such as flooding and extreme heat are projected to increase in BC over the next few decades and will be extremely costly for cities to manage. As well, species are struggling to adapt to changing weather patterns and climate extremes combined with the impacts of human development. Planning for resilience while reducing emissions is more important than ever. Restoring and maintaining ecosystems to respond to these issues is cheaper than using hard infrastructure and has multiple benefits. Ecosystems can absorb and store both flood waters and carbon, and increase resilience while reducing emissions at the same time in other ways as well, such as reducing the impacts of extreme heat and therefore the need for air conditioning. Ecosystem presence has also been shown to increase property values, contribute to physical and mental health, and help other species survive both climate change and the impacts of human development. Experts are beginning to attribute value to ecosystems at the level of capital assets, acknowledging the benefits provided by water bodies, forests, aquifers and foreshores and the extraordinary costs that would be required to replace them. Cities stand to gain the most from ecosystem benefits, given the localized effects of climate change. But many ecosystems cross municipal boundaries, and cities often lack the capacity for collaboration that is essential to restore and maintain ecosystem health, resulting in fragmentation and loss of these values and benefits. However, cities can achieve these goals and enjoy the benefits by partnering with neighbouring cities and community members to ensure ecosystem health. This new case study of Still Creek from ACT at SFU’s Pacific Water Research Centre illustrates successful collaboration on ecosystem restoration between the cities of Vancouver and Burnaby in Metro Vancouver. Partnership, creative governance, community engagement, and innovative funding approaches were all essential components that helped the two cities come together to invest in ecosystem health and restore Still Creek, one of only two daylit streams in the City of Vancouver. This collaboration led to many benefits, including the return of spawning salmon, after decades of pollution and neglect. 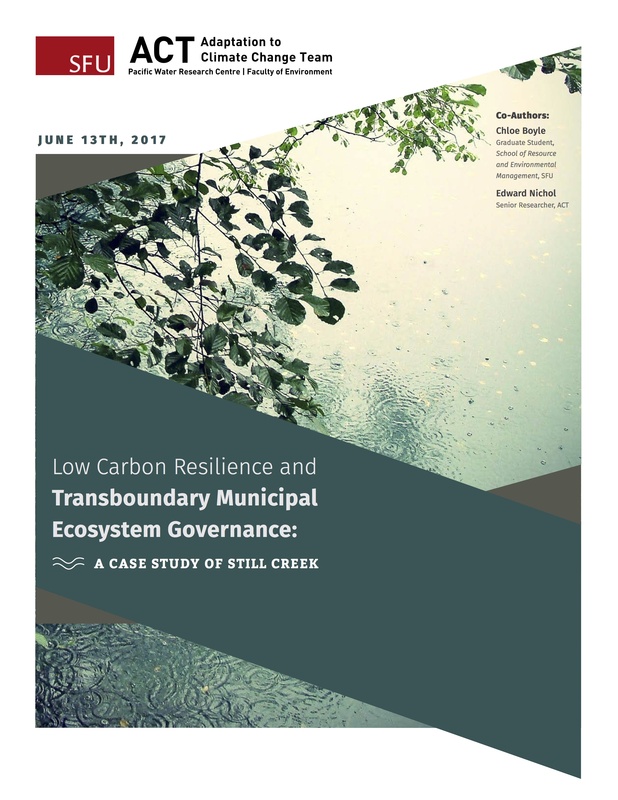 A POLICY REPORT that tracks the background decision-making processes over time for the developments in Still Creek, and identifies challenges and the key factors that led to success, as well as recommendations for other municipalities considering action on transboundary ecosystem governance. The report includes several appendices: Literature reviews of ecosystem health indicators and methods for establishing ecosystems goods and services/ecosystem valuation; case studies of two other ecosystem areas that were considered for the project but not pursued (Boundary Bay and North Shore forests); a more detailed breakdown of jurisdictional influences; and an in-depth management history. A WEBINAR describing the concepts and rationale that informed our Still Creek project research, as well as the key research findings. The webinar also features content from ICLEI Canada’s Ewa Jackson, who discusses the role of nature in low carbon resilient communities.